Stories for Khalsa Children include free mp3 album downloads with CD purchases. Guruliv Singh was a storyteller who recorded many stories in the late 1970's using simple technology of the time. The stories he told have since become classics to children for the past 30 years who have listened to them. Simple sound effects and music, along with his energetic voice and ever changing voice, he entertained and inspired many children. 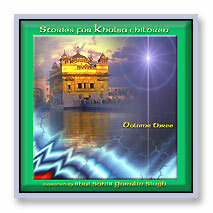 Stories from Sikh history (Sakhis) told in English. These are not fables rather they are historically accurate stories of the lives and teachings of the 10 Sikh Guru's and their Sikhs. The stories are very easy to listen to, and entertaining with voices, music and sound effects. Not only that but each story has a beautiful lesson to be learned. The stories are geared for children of any age, but they are equally applicable, and entertaining for adults. The content of the stories vary. Most stories are straight from Sikh History, but others are more modern in nature (like stories of being different, and overcoming the challenges/responsibilities of being a Sikh). Some stories are more general in nature with a lesson or moral about being a good person and being spiritual. Click on Guruliv Singh's albums to discover details and hear and purchase CDs or downloads.